We have a huge Rugosa hedge and at this time of year it is bursting with hips, more than enough for me to pick my fill and still leave plenty for the birds. They are one of the richest sources of vitamin C (rosehip syrup was a popular means to keep vitamin C levels up, especially in children, during the winter months). We use it for rosehip jelly, rosehip syrup and also rosehip oil. Rosehip oil is wonderful for the skin. Packed with anti-oxidants and anti-inflammatory properties it is a permanent resident in my bathroom cupboard. True rosehip oil is made by cold pressing the seeds. Despite the fact I have succeeded in distilling my own rosewater (and broke a sink with the brick afterwards) I have yet to build a cold press in my kitchen. However, I have found an alternative. First of course you need to pick your rosehips. Remove the stalks and tails and any of the hairy seeds (great for itching powder). I harvest with a pair of kitchen scissors and cut the debris away as I pick. Next chop finely, I put mine in a food processor. Finally you place the macerated rosehips in a heavy bottomed pan with the oil of your choice. 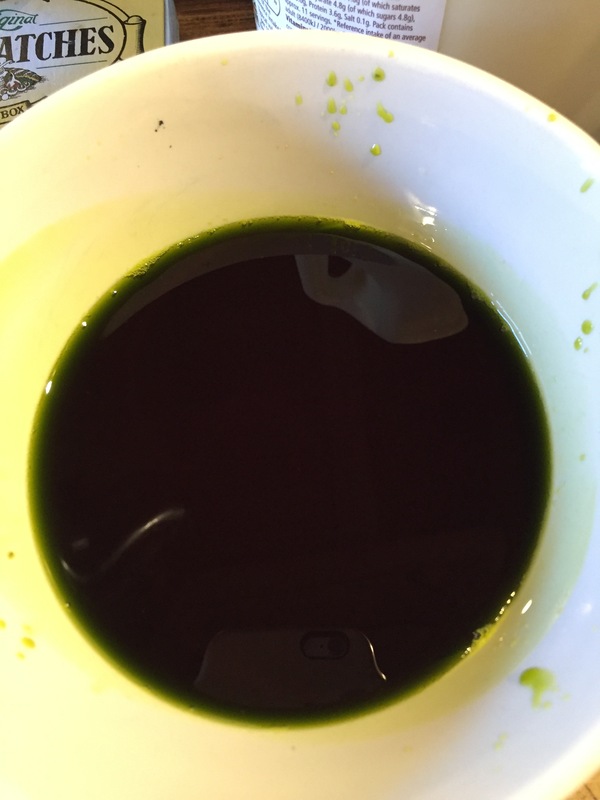 I used 1 litre of Avocado oil this year, but any natural oil will do, avoid olive oil – it has rather a strong smell and can overpower the rosehips. Bring to the boil and then leave to simmer on the lowest heat possible for about 6-8 hours. You could also use a slowcooker or yoghurt maker. Strain through a jelly bag or cheesecloth and store in sterilised dark bottles. Store out of sunlight. Let’s start with the comfrey. Comfrey goes by many names Knitbone, Boneset, Bruise wort. You get the gist, it’s a healer. There is much discussion about the safety of comfrey due to its very high content of hepatotoxic pyrrolizideine alkaloids (PAs) wh rapich as you can guess from the name can lead to liver disease in high doses and it has been implicated in one death. Consequently I only use it topically, in a salve, tincture or fresh compress. See here to see it in action. First collect your comfrey. This is remarkably easy around us as the Boss planted it some 10 years ago and it is very hardy! I collect both leaves and the root, there is a higher level of allantoin, which stimulates cell growth (and thus healing) and reduces inflammation in the root, but also a higher level of PAs. Again I only use comfrey products externally and would caution anyone who wishes to take it internally to seek the advice of a professional herbalist first. I made two types of salve and a tincture. Salve one was made using the oldest and most traditional method. Chop up your leaves and add them melted lard. I used 125g lard and four handfuls of leaves. 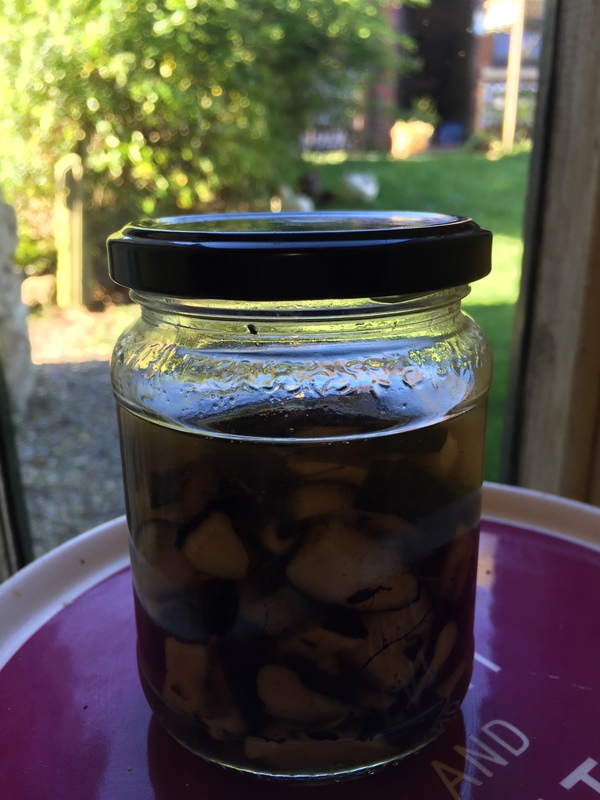 Bring to a simmer, cover and leave to seep for a couple of hours and pour into a sterilised jar (you may need to warm it slightly to melt it sufficiently to pour into the jar. Looks a bit poisonous doesn’t it?! Salve two is the process I first learned when making salves. Instead of using lard I used coconut oil and cold pressed rapeseed oil. The first stage is the same as making salve one. 125ml of rapeseed oil and three tablespoons of coconut oil, four handfuls of leaves, chopped. Bring to simmer, leave to seep. What you have now is comfrey oil and you can leave it like that. It is a good massage oil for those broken bones that cannot be set (such as toes and shoulders). If you want to make a m ore solid salve you will need approximately 30g of beeswax (the amount you use will determine the solidity of your salve). Grate the wax and place with the comfrey oil in a bowl over a pan of boiling water and heat gently until the wax and oil are combined. Pour into sterilised jars. Comfrey Tincture is the easiest recipe of all. Wash and chop 100g of comfrey root and place in a clean jar with 150ml of vodka (the highest proof you can find, I am kicking myself for not buying the 96% vodka I saw on sale in Romania for about £15/litre!) Leave it for 2-3 weeks and transfer to clean amber dropper bottles. 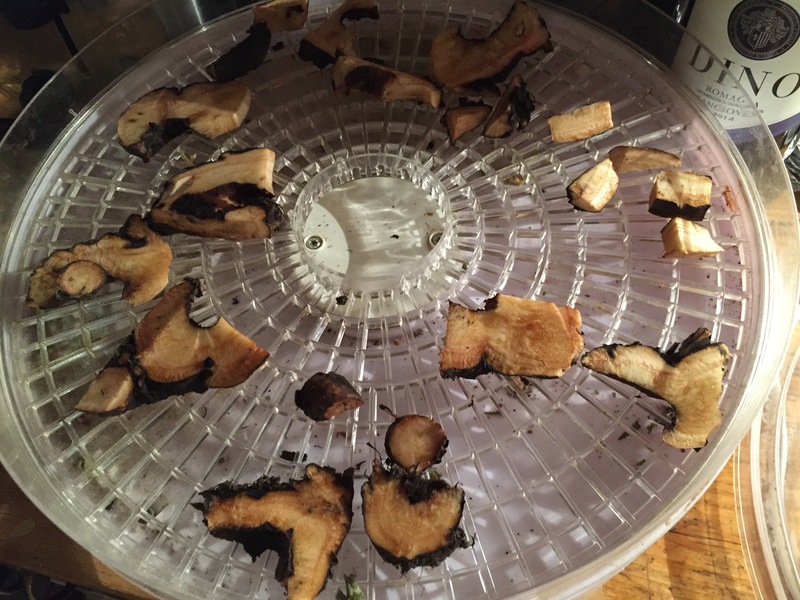 Finally I put the leftover root in the dehydrator and will grind it up to make tincture or salve later on in the year if we run out. I made it just in time. A couple of days ago the nasturtiums were in full bloom, a wave of yellow, orange and red across the courtyard. Today they are the sorry leftovers of a super slug feast. Like slimy locusts they have laid the courtyard bed bare. Fortunately I had been in and harvested the seeds a few days earlier and now have my very own homegrown “capers” pickling away. Harvesting nasturtium seeds is easy. They are huge great things (for seeds) up to a centimetre long and look a little like mini brains. They come away from the plant easily and you can often see them on the ground underneath the flowers. First you need to wash them and then soak them in brine (about 50g salt to 500ml water) for 24 hours. The following day rinse and pack into sterilised jars and cover with boiling pickling vinegar. In theory you could use standard vinegar but pickling vinegar gives pickles that slightly rich flavour. You can buy packs of pickling spices or make up your own mix using, for example, mace, cinnamon, cloves, peppercorns, cardomom, coriander, juniper berries, bay leaves. Add the spices to the vinegar, bring to the boil then leave to cool for a minimum of a couple of hours, though overnight is better. Seal with a well fitting lid or use a kilner jar. They should be ready to eat in two to three weeks. Pretty much any fruit or vegetable can be pickled, I pulled out shedloads of wild leek earlier in the spring and pickled the bulbs. I also adore pickled eggs and as we have hens it is a perfect way to use up the inevitable excess! 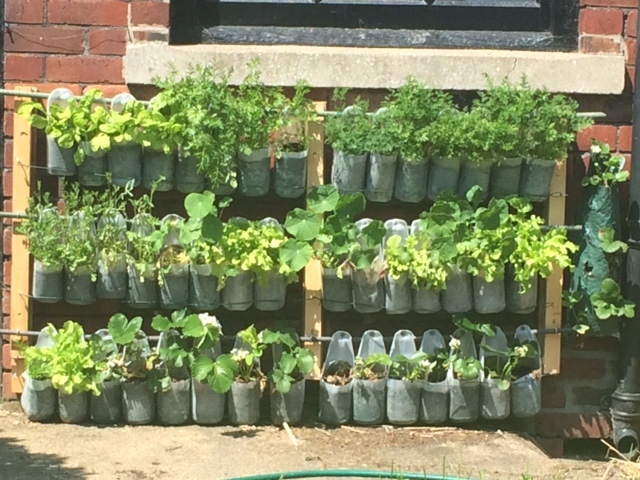 How did you get along with the repurpose challenge? For the final Friday challenge I repaired a photo frame that had been propped against a wall for eons and my knitting bowl that had a disagreement with the floor! Not sure if it counted but I podded a bowlful of mangetout that had been allowed to grow on. The peas are not great, a bit to marrow-fat for my liking but they made delicious soup and far better than putting them in the compost. The chooks enjoyed burrowing for the handful I thew on the grass as well. This week has been Olympic week. Especially exciting as we watched Duncan Scott who we have known since he was a wee tot win Silver medal in the 4 x 200m freestyle relay and set a new British record in the 100m freestyle. The final for the latter is at 3.00 am UK time on Friday morning if you want to cheer him on! Watching the Olympics it is easy to get caught up in the razzmatazz and excitement and forget about the all the hard work that goes into just getting there in the first place. Duncan announced he wanted to swim in the Olympics when he was nine, that’s ten years of early starts, homework in the back of the car on the way to evening training. Ten years of driving across the country to swim in qualifying heats. Ten years of physical hard slog. Furthermore it’s not just Duncan that had to make sacrifices, who do you think drove Duncan across the country, sacrificed family holidays for training and so on? Then there are the sports clubs, the ones that train our Olympians. They don’t run themselves, someone has to be official timer, keep the books, fundraise, all volunteers. There is much more going on behind the scenes than we ever see on the screen. So when you look at your plastic bags, or the recycling that didn’t make it to the recycling box; when you buy a takeaway because you are just too tired and too hungry to cook; when you look at all the stuff you have accumulated and wonder how on earth it got there, don’t worry, don’t give up. It took ten years for Duncan to become an Olympian and he worked at it seven days a week, 365 days a year. Nobody expects you to downsize, declutter, go plastic free, live off grid (delete as appropriate 🙂 ) seven days a week, 365 days a year. You have other responsibilities, needs, goals, ideals to fit in as well. Do what you can, maybe up the ante every now and then and nudge yourself on. But don’t beat yourself up and give up because you haven’t achieved it all in a year. Watch the Olympics and remind yourself that nothing is quite as easy as it may look and congratulate yourself on getting as far as you have already.